Several neuromuscular diseases involve dysfunction of neuromuscular junctions (NMJs), yet there are no patient-specific human models for electrophysiological characterization of NMJ. We seeded cells of neurally-induced embryoid body-like spheres derived from induced pluripotent stem cell (iPSC) or embryonic stem cell (ESC) lines as monolayers without basic fibroblast factor (bFGF) and observed differentiation of neuronal as well as spontaneously contracting, multinucleated skeletal myotubes. The myotubes showed striation, immunoreactivity for myosin heavy chain, actin bundles typical for myo-oriented cells, and generated spontaneous and evoked action potentials (APs). The myogenic differentiation was associated with expression of MyoD1, myogenin and type I ryanodine receptor. Neurons formed end plate like structures with strong binding of α-bungarotoxin, a marker of nicotinic acetylcholine receptors highly expressed in the postsynaptic membrane of NMJs, and expressed SMI-32, a motoneuron marker, as well as SV2, a marker for synapses. Pharmacological stimulation of cholinergic receptors resulted in strong depolarization of myotube membrane and raised Ca2+ concentration in sarcoplasm, while electrical stimulation evoked Ca2+ transients in myotubes. Stimulation of motoneurons with N-Methyl-D-aspartate resulted in reproducible APs in myotubes and end plates displayed typical mEPPs and tonic activity depolarizing myotubes of about 10 mV. We conclude that simultaneous differentiation of neurons and myotubes from patient-specific iPSCs or ESCs results also in the development of functional NMJs. Our human model of NMJ may serve as an important tool to investigate normal development, mechanisms of diseases and novel drug targets involving NMJ dysfunction and degeneration. Early and selective loss of neuromuscular synapse subtypes with low sprouting competence in motoneuron diseases. The addition or loss of synapses in response to changes in activity, disease, or aging is a major aspect of nervous system plasticity in the adult. The mechanisms that affect the turnover and maintenance of synapses in the adult are poorly understood and are difficult to investigate in the brain. Here, we exploited a unique anatomical arrangement in the neuromuscular system to determine whether subtypes of synapses can differ in anatomical plasticity and vulnerability. In three genetic mouse models of motoneuron disease of diverse origin and severity, we observed a gradual and selective loss of synaptic connections that begun long before the onset of clinical deficits and correlated with the timing of disease progression. A subgroup of fast-type (fast-fatiguable) neuromuscular synapses was highly vulnerable and was lost very early on. In contrast, slow-type synapses resisted up to the terminal phase of the disease. Muscle-specific differences were also evident. Similar selective losses were detected in aged mice. These selective vulnerability properties of synapses coincided with hitherto unrecognized major differences in stimulus-induced anatomical plasticity that could also be revealed in healthy mice. Using paralysis and/or growth-associated protein 43 overexpression to induce synaptic sprouting, we found that slow-type, disease-resistant synapses were particularly plastic. In contrast, fast-type synapses with the highest vulnerability failed to exhibit any stimulus-induced change. The results reveal pronounced subtype specificity in the anatomical plasticity and susceptibility to loss of neuromuscular synapses and suggest that degenerative motoneuron diseases involve a common early pathway of selective and progressive synaptic weakening also associated with aging. To build a synapse: signaling pathways in neuromuscular junction assembly. Synapses, as fundamental units of the neural circuitry, enable complex behaviors. The neuromuscular junction (NMJ) is a synapse type that forms between motoneurons and skeletal muscle fibers and that exhibits a high degree of subcellular specialization. Aided by genetic techniques and suitable animal models, studies in the past decade have brought significant progress in identifying NMJ components and assembly mechanisms. This review highlights recent advances in the study of NMJ development, focusing on signaling pathways that are activated by diffusible cues, which shed light on synaptogenesis in the brain and contribute to a better understanding of muscular dystrophy. Journal ID (publisher-id): Front. Cell. Neurosci. Copyright statement: Copyright © 2015 Puttonen, Ruponen, Naumenko, Hovatta, Tavi and Koistinaho. 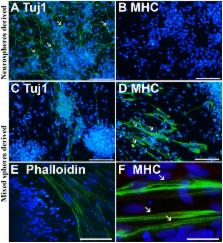 An in vitro model for studying neuromuscular transmission in the mouse pharynx. Pre-and post-junctional effects of tubocurarine and other nicotinic antagonists during repetitive stimulation in the rat. Structure and physiology of developing neuromuscular synapses in culture.